Don’t have the right tool? You sure do! 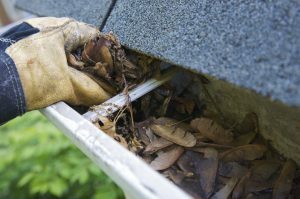 When it comes to cleaning out your gutters, there’s lots of items you can use and chances are, they’re already in your kitchen or your garage. Tongs, extension poles, trowels, and leaf blowers all work wonders. We recommend wearing some safety gear. Gloves, a mask and goggles can help keep you protected while you’re up on the ladder or on the roof. Make sure your ladder is secure. It’s not a bad idea to ask a friend or a neighbor to come out to hold the ladder while you’re standing on it and be sure to use a stabilizer or stand-off to prevent any damage to your gutters. Don’t forget about the downspouts. Even if the gutters are clear, water can have trouble draining if the downspouts are clogged. Use a hose or auger to to clean out any built-up dirt and debris. North East Home Improvement is the experienced, local choice for gutter installation, maintenance, and repair. We offer professional service at a cost that you won’t shudder to hear. Give us a call today at (203) 321-6695 to speak with our experts or to schedule an appointment. I really appreciate your tip to ask a friend or neighbor to help hold the ladder steady for you so you can be safe while working on your roof. My wife and I have been thinking of getting a new house, and we want to make sure that we can properly drain the water from all of the rainstorms that we get. I will be sure to tell my wife that we should try and be safe on the ladder if we need to make any repairs!